Paris – 25 November 2014 - The Intergovernmental Committee for the Safeguarding of the Intangible Cultural Heritage, meeting at UNESCO Headquarters until 28 November 2014, inscribed "Safeguarding of the carillon culture" from Belgium on the Register of Best Safeguarding Practices. The art of making music with bells (carillon) is performed by carillonners, traditionally during market and festive days. The programme to safeguard carillon culture exists in seventy-six cities and villages of Belgium and in thirty countries worldwide. The primary objectives are to preserve the components of historic carillon culture (practices, repertoire, instruments, music, oral and written history), and to ensure the continuity and sustainable development of carillon music as a living heritage that fosters cultural identity and social cohesion. Safeguarding efforts have also focused on preserving and restoring historic carillons with many formerly silent carillons now once more active. 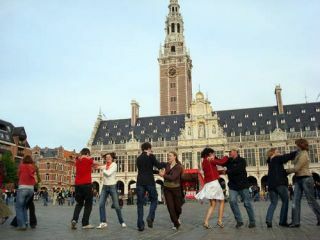 Transmission is secured by a number of educational initiatives, of which the Mechelen carillon school is the most important. Efforts have also been undertaken to revitalize the carillon, including promotion of new arrangements, compositions and genres of music. The programme combines respect for tradition with a willingness to innovate, constantly seeking new ways to safeguard carillon culture in contemporary society. It also promotes proven best practices, as well as a deep respect for local players in the field, building on cooperation among actors. The Register of Best Safeguarding Practices allows States Parties, communities and other stakeholders to share successful safeguarding experiences and examples of how they surmounted challenges faced in the transmission of their living heritage, its practice and knowledge to the future generation. These methods and approaches should be useful as lessons and models that can be adapted to other circumstances, including those in developing countries.